Lock in a great price for Stone Town Cafe B&B – rated 8.7 by recent guests! Very friendly and helpful staff, including Ali who was always there to help. Comfortable beds in a/c room with plenty of space and quiet. Excellent made to order breakfast included. Great location, a short walk from everything in Stone Town. Great location, spacious room, comfortable bed and decent wifi. Plus staff - Ali and Elias - went out of their way to help. Perfect location, nice bed and day bed, excellent coffee. Breakfast is exceptional - you choose anything off the menu at the cafe downstairs (10,000Tzs or less). Amazing coffee and tea as well. The rooms were spotlessly clean and the bed was very comfortable. The owners were very responsive via e-mail and obviously care greatly about their B&B/Cafe. If we ever return to Zanzibar, no question we will stay here again! We stayed for three nights - the perfect amount of time to see Stone Town. Fantastic location, kind and attentive staff, beautiful room, comfortable bed! I loved staying at the Stone Town Cafe and B&B, and hope to go back again. The friendly cafe below makes it a great, welcoming place for the solo traveller. Coffee is excellent! I loved everything about this facility from the location, management, and people that worked there. I highly recommend this facility. Location was perfect! 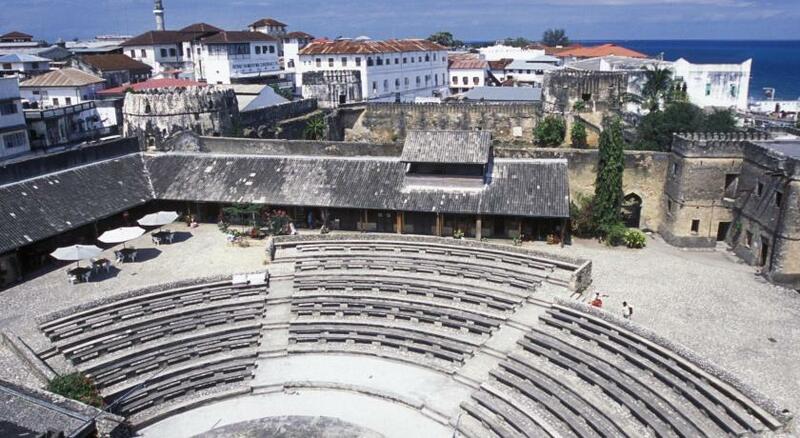 5 minutes from just about everything you’ll want to see in Stone Town! Food was great.. bed comfy.. shower hot! As a solo female traveller.. I cannot recommend enough.. felt very safe! Asante! Fantastic location in the heart of Stonetown. Exceptionally friendly and helpful staff. Food was excellent and great value for money. The eating area setting was so comfortable with the palms, so even though you were situated right on a street it felt like you were in a courtyard. Quiet rooms in the back side which is rare in Stone Town, bed with REAL mattresses. We also loved their organic soaps! They have Spacious rooms, breakfast is included. Manager was also very welcoming. 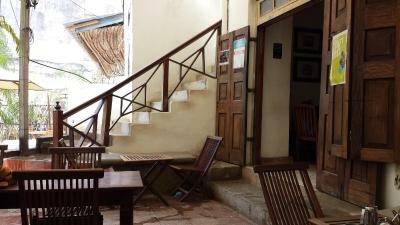 Located in Zanzibar City, Stone Town Cafe B&B has accommodations with seating area. Free WiFi is featured. All units feature air conditioning and a flat-screen TV. There's a private bathroom with shower in all units, along with free toiletries and a hair dryer. At the bed and breakfast you'll find a restaurant serving International cuisine. 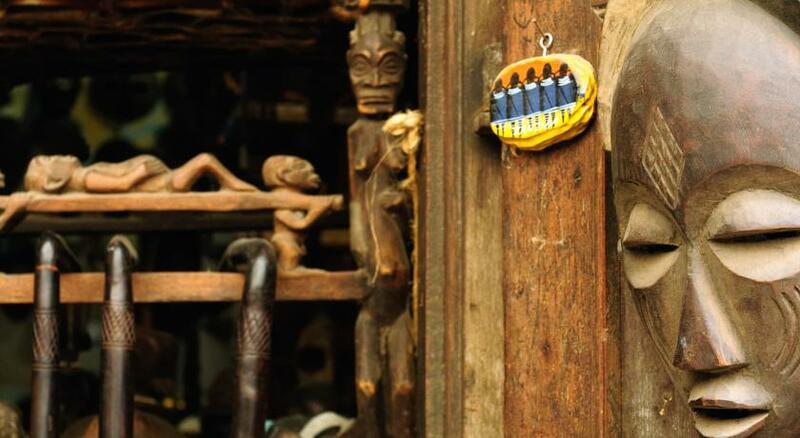 Peace Memorial Museum is an 11-minute walk from Stone Town Cafe B&B, while The Zanzibar Curio shop is 0.6 miles away. 뀐 Located in the top-rated area in Zanzibar City, this property has an excellent location score of 9.6! When would you like to stay at Stone Town Cafe B&B? House Rules Stone Town Cafe B&B takes special requests – add in the next step! Please inform Stone Town Cafe B&B of your expected arrival time in advance. You can use the Special Requests box when booking, or contact the property directly using the contact details in your confirmation. Bathroom falling apart, with fan open to outside. Hot water lukewarm. But clean and functional. There was nothing that we did not like. We would book in there again. Some of the staff speak little English. 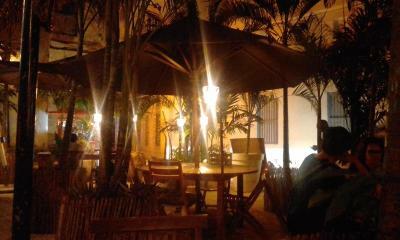 wonderful relaxed atmosphere...perfect for chilling out. very liberal helpful management and staff. a popular place to relax in the cafe...the room was excellent. loved it! If they took credit cards for payment, that would have helped. Other than that, nothing. This hostel is in a perfect position for visiting the city. The staff was great, especially for providing us with information for trips and fair prices of guides and tours. Food is delicious and cheap. Our room although spatious and comfy, was just above the kitchen, always busy and buzzing with noise. We did not open windows because there was always someone outside. The ac was not working and we had to change rooms and got a really small one which didn't have enough space for all of us. If you stay the night here it might be a little noisy since its right on the road but then anywhere in Stone Town is generally noisy. We just spent the day here since we had a late night flight. The room was basic and clean and I liked that the toilet had a muslim shower. The food at the café is nice and offers wifi. The location is great, right in the center. Not clean bathroom, old furniture. Not worth the money. Food at the cafe never let us down. Staff are super friendly and helpful. The location was great! Walking distance from everything you could want to see. The staff was friendly. The iced teas in the cafe are delicious. The breakfast was nothing special. The rooms are clean and spacious with comfortable beds - the pillows were only so-so. There is airconditioning but with the heat of Stone Town, we would have loved it to be stronger. Loved Stone Town Cafe & B&B for the location, super friendly staff, spacious room and comfortable bed! The cafe downstairs is a lovely oasis with the best banana crepes and coffee i've had in a long time. Great value for money, would highly recommend for couples/ solo travellers.